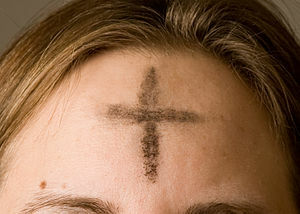 Lent begins in ashes. On Ash Wednesday we are reminded of our mortality and sin. It is not a time for groveling; rather, it is a time for reality, for genuine humility, for repentance and forgiveness and renewed commitment to following the ways of Jesus. Lent is a season of preparation, preparing to Jesus’ passion and death for us and then to Easter. Isaiah 58:1-12 – A denunciation of the injustices of those who only act at their religion. There is a promise of the Lord’s favor for those who genuinely repent and care for the needy. 2 Corinthians 5:20b-6:10 – Paul urges the new disciples to be reconciled to God in this time of deliverance, and he reminds them of all the hardships he has patiently endured for their sake and for the gospel. Matthew 6:1-6, 16-21 – Jesus describes genuine charity, prayer and fasting. Remember, human, that you are dust, and to dust you will return. From the Ash Wednesday liturgy, based on Genesis 3:19. Covenant with a faithful God forms the context for this Year B’s Lenten journey. The Hebrew Scriptures offer reminders of God’s promises of life and relationship made to Noah and his family, Abraham and Sarah, and Jeremiah. Christians experience God’s covenant of faithfulness continuing in Jesus – God-with-us – who shares our life and our death. Lent begins with the black and gray of Ash Wednesday. Lent ends with the red of Good Friday. Along the way the church wears purple, a color long associated with penitence. This entry was posted in Feast Days, Lent and tagged Abraham, Ash Wednesday, covenant, Gospel of Matthew, Jeremiah, Jesus, Lent, Noah. Bookmark the permalink.